Researchers are warning of a new blight on the ocean: a swirl of confetti-like plastic debris stretching over thousands of square miles in a remote expanse of the Atlantic Ocean. The debris is harmful for fish, sea mammals - and at the top of the food chain, potentially humans - even though much of the plastic has broken into such tiny pieces they are nearly invisible. "Our job now is to let people know that plastic ocean pollution is a global problem - it unfortunately is not confined to a single patch," Cummins said. On the voyage from Bermuda to the Azores, they crossed the Sargasso Sea, an area bounded by ocean currents including the Gulf Stream. They took samples every 100 miles with one interruption caused by a major storm. Each time they pulled up the trawl, it was full of plastic. Long trails of seaweed, mixed with bottles, crates and other flotsam, drift in the still waters of the area, known as the North Atlantic Subtropical Convergence Zone. Cummins' team even netted a Trigger fish trapped alive inside a plastic bucket. "It's shocking to see it firsthand," Cummins said. "Nothing compares to being out there. We've managed to leave our footprint really everywhere." "Humanity's plastic footprint is probably more dangerous than its carbon footprint," he said. 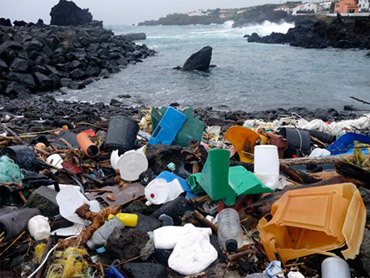 "That plastic has the potential to impact our resources and impact our economy," said Lisa DiPinto, acting director of NOAA's marine debris program. "It's great to raise awareness so the public can see the plastics we use can eventually land in the ocean." "Unfortunately, the kinds of things we use plastic for are the kinds of things we don't dispose of carefully," Savitz said. "We've got to use less of it, and if we're going to use it, we have to make sure we dispose of it well."